With rising transistor budgets and the trend toward system-on-a-chip design, designing an entire complex ASIC or ASSP in house has become increasingly impractical. As a result, the market for licensed function blocks, known as intellectual property (IP), is growing rapidly. The most popular IP blocks are programmable processors such as CPUs and GPUs. As system designers seek simpler ways to connect all of their IP cores, we have seen surging interest in network-on-a-chip (NoC) IP as well. Several suppliers provide CPU IP, each offering unique advantages. Some CPUs are easily customized, others include security features, while still others support multicore implementations. GPUs can accelerate 2D, 3D, and/or vector graphics using fixed or programmable engines. NoC IP provides a scalable and configurable interconnect to reduce the design burden. For all types of IP, the available options range widely in performance, die area, and power. "A Guide to CPU Cores and Processor IP" sorts through these options, evaluating the high-performance designs available from the leading IP vendors. The report provides in-depth coverage of CPUs and GPUs, including those from ARM (Cortex, Mali), Cadence (Tensilica), Imagination (MIPS, PowerVR), Synopsys (ARC), and VeriSilicon (Vivante). Also covered are Adapteva, Andes, Beyond Semiconductor, Cortus, and RISC-V, as well as NoC IP vendors Arteris, NetSpeed, and Sonics. For each vendor, we describe each IP core offered, provide key metrics such as performance and die area, discuss important topics such as development tools and support, outline the future roadmap, and summarize the strengths and weaknesses of the offering. The report also provides background on how IP is used, an overview of common end markets such as consumer electronics and networking equipment, and market share and forecast data for the types of IP covered. We conclude with a side-by-side comparison of IP cores and our long-term views on the industry. As the leading vendor of technology analysis for mobile and communications chips, The Linley Group has the expertise to deliver a comprehensive look at this burgeoning market. Analysts Mike Demler and Loyd Case use their extensive experience in the semiconductor market to deliver the technical and strategic information you need to make informed business decisions. Whether you are looking for an innovative solution for your design, a vendor to partner with, or a rising company to invest in, this report will cut your research time and save you money. Get the inside scoop on this major market. 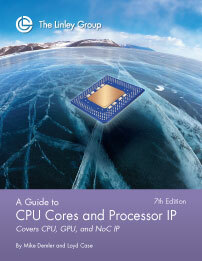 Order "A Guide to CPU Cores and Processor IP" today. Updates to the Seventh Edition of "A Guide to CPU Cores and Processor IP"
"A Guide to CPU Cores and Processor IP" has been updated to incorporate new announcements made since the publication of the previous edition. The processor-IP market continues to grow as more SoC designers adopt licensed cores for CPUs, GPUs, and NoCs. More than 22 billion chips containing CPU IP shipped during 2016. Despite slowing growth for smartphones and tablets, CPU-IP shipments increased by 10% in 2016, compared with a 23% surge the prior year. Even though the mobile market is maturing, we expect emerging applications such as automotive ADAS and the Internet of Things (IoT) to drive an 11% compound annual growth rate (CAGR) through 2020. In 2016, shipments of licensed GPUs improved by 19% owing to a loss of mobile-market share by companies such as Intel and Qualcomm, which use in-house designs. Mobile shipments employing licensed GPUs rose several percent, and customers upgrading to larger smart TVs with graphical user interfaces created a brisk market. Cellular handsets continue to be the highest-volume market for CPU and GPU IP. A single handset may have separate CPUs for the cellular baseband, application subsystem, sensor hub, and peripheral functions such as Bluetooth, GPS, Wi-Fi, touchscreen, and power management. Other large markets include chips for consumer electronics such as digital TVs, media players, and set-top boxes; processors for home networking gear such as broadband gateways and Wi-Fi routers; storage controllers for hard drives and flash-memory drives; and processors for communications infrastructure and data-center servers. Because of their growing complexity, most of these systems use ever more and faster CPUs. Process-technology advances enable companies to integrate large numbers of CPU cores on a single chip. Chip designers face a make-versus-buy decision for CPUs; most choose to buy (license) an IP core and focus their efforts on combining IP blocks, peripherals, and custom logic into a design that’s ideal for their end application. This report also covers licensable network-on-a-chip (NoC) IP. NoCs address the problem of increasing complexity in modern SoCs, providing an automated method of linking all the cores together. Unlike CPU and GPU cores, implementing a NoC requires customization for the unique architecture of each SoC and thus demands a robust and highly automated tool set. Compared with designing interconnects by hand, this approach helps optimize power and ensures timing closure. ARM is by far the leading CPU-IP supplier, having a 77% share in 2016. The company added several new CPU cores during that year, including the low-cost Cortex-M23/M33, the resilient Cortex-R52, and the high-performance Cortex-A73. Synopsys enhanced its CPU lineup with the new ARC SEM series, which offers enhanced security features. In 2016, the company also added a new deep-learning computer-vision subsystem to its DesignWare catalog. In 2016, Imagination Technologies released only one new CPU core — the MIPS I6500. That midrange design offers an alternative to ARM’s “little” cores, but it’s less area and power efficient. It remains popular with customers such as Mobileye, however, owing to its unique hardware multithreading capability. Cadence’s customizable Xtensa CPU shipments rose by 31% in 2016. Rather than offer new preconfigured designs, the company emphasizes frequent updates to its base LX architecture, in addition to offering application-specific subsystems. A number of smaller CPU-IP vendors — such as Andes, Beyond Semiconductor, and Cortus — offer alternatives to customers for whom compatibility with a more well-known instruction set is less important than customizable features, small die size, and low licensing fees. These cores mostly target low-cost deeply embedded devices. A new competitor has emerged in RISC-V, a royalty-free instruction set with open-source CPU cores. Among GPU-IP products, ARM’s Mali family extended its popularity from low-cost to premium smartphones, leading in unit shipments. The market share of Imagination’s PowerVR declined to less than 30% as its Series7 cores fell behind Mali in performance per unit area and its high-end Series8 design was delayed. VeriSilicon completed its acquisition of Vivante, which provides GPUs for consumer electronics as well as for high-reliability applications such as aerospace and military. Sonics is the largest independent developer of NoC IP, offering the broadest range of NoCs, including subsidiary products for memory control and power management. Arteris complements its basic NoC features with a timing-closure tool and support for fault-tolerant networks. In 2016, it added a cache-coherent interconnect to its product line. NetSpeed emphasizes support for cache-coherent processors with its NoCs, and it delivers the industry’s most highly automated implementation tools. ARM added a new mesh network to its CoreLink portfolio. The company’s connectivity IP is widely used for clusters of CPUs, but it lacks a comprehensive and automated solution to match the offerings from the smaller independent NoC vendors. Different designers emphasize different parameters for the IP they use, such as interfaces, I/O bandwidth, power consumption, die area, performance, instruction-set compatibility, and roadmap. Therefore, selecting the right IP is a complex and difficult task. This report details each vendor’s products, strategy, and market position, covering CPU, GPU, and NoC IP. Figure 1‑1. Block diagram of a generic basic phone. Figure 1‑2. Block diagram of a generic application processor. Figure 1‑3. Block diagram of a generic mobile Wi-Fi chip. Figure 1‑4. Block diagram of a generic digital-TV chip. Figure 1‑5. Block diagram of a generic 802.11 access point. Figure 1‑6. Block diagram of a generic high-end hard-drive controller. Figure 2‑1. Logic circuit that implements simple Verilog code. Figure 2‑2. GDS II file being edited in Magic. Figure 2‑3. Raster graphics versus vector graphics. Figure 2‑4. Apple’s Cover Flow effect. Figure 2‑5. Standard hard-wired 3D pipeline. Figure 2‑6. Standard programmable 3D pipeline. Figure 3‑1. CPU pipelining examples. Figure 3‑2. Generic multicore processor. Figure 3‑3. Interleaved tasks on a multithreaded processor. Figure 3‑4. Block diagram of a generic CPU. Figure 3‑5. Block diagram of a generic shader-based 3D GPU. Figure 3‑6. Block diagram of a bus matrix. Figure 3‑7. Block diagram of a generic NoC. Figure 4‑1. Unit market share for 32/64-bit CPU IP, 2015–2016. Figure 4‑2. Unit market share for 32/64-bit GPU IP, 2015–2016. Figure 4‑3. CPU-IP shipments by application category, 2016. Figure 4‑4. GPU-IP shipments by application category, 2016. Figure 4‑5. Mobile-device forecast, 2014–2020. Figure 4‑6. Embedded-device and flash-memory forecast, 2014–2020. Figure 4‑7. Consumer-electronics forecast, 2014–2020. Figure 4‑8. Enterprise-device forecast, 2014–2020. Figure 4‑9. CPU-IP forecast by application category, 2014–2020. Figure 4‑10. GPU-IP forecast by application category, 2014–2020. Figure 5‑1. Baseline and mainline features in the ARMv8-M ISA. Figure 5‑2. Relative area and performance of ARM Cortex-A CPUs. Figure 5‑3. Block diagram of ARM Big.Little system architecture. Figure 5‑4. Block diagram of ARM Cortex-A7 CPU. Figure 5‑5. Block diagram of ARM Cortex-A57 CPU. Figure 5‑6. Block diagram of ARM Cortex-A72 CPU. Figure 5‑7. Block diagram of ARM Cortex-A73 CPU. Figure 5‑8. Pipeline diagram of ARM Cortex-A53 CPU. Figure 5‑9. Pipeline diagram of ARM Cortex-A35 CPU. Figure 5‑10. Block diagram of ARM Cortex-R7 CPU. Figure 5‑11. Block diagram of ARM Cortex-R52 CPU. Figure 5‑12. Block diagram of ARM Cortex-M7 CPU. Figure 5‑13. Block diagram of ARM Cortex-M33 CPU. Figure 6‑1. Andes N8 CPU in an electronic-label controller. Figure 7‑1. Block diagram of the Xtensa LX7 microarchitecture. Figure 8‑1. History of the MIPS ISA. Figure 8‑2. Block diagram of MIPS P6600 CPU. Figure 9‑1. Basic RISC-V instruction formats. Figure 9‑2. Block diagram of SiFive E310 CPU. Figure 10‑1. Block diagram of Synopsys ARC HS38 CPU with extensions. Figure 11‑1. Block diagram of Adapteva Epiphany CPU. Figure 13‑1. Block diagram of ARM Mali-T860 GPU. Figure 13‑2. Comparison of Midgard and Bifrost quad processing. Figure 13‑3. Block diagram of Bifrost shader core. Figure 13‑4. Block diagram of Bifrost GPU architecture. Figure 14‑1. Imagination PowerVR product generations. Figure 14‑2. Block diagram of PowerVR Series7XT shader. Figure 14‑3. Block diagram of PowerVR Series7 GT7600 GPU. Figure 14‑4. Die photo of PowerVR GT7600 GPU in Apple A10 processor. Figure 15‑1. Block diagram of VeriSilicon GC8000 architecture. Figure 17‑1. Block diagram of CoreLink SIE-200 system bus. Figure 17‑2. Block diagram of Ncore SoC. Figure 17‑3. NetSpeed SoC design automation. Figure 17‑4. SonicsStudio user interface. Table 4‑1. Unit market share for 32/64-bit CPU IP, 2015–2016. Table 4‑2. Unit market share for 32/64-bit GPU IP, 2015–2016. Table 5‑1. Key parameters for selected ARM 32-Bit Cortex-A CPUs. Table 5‑2. Key parameters for ARM 64-Bit Cortex-A CPUs. Table 5‑3. Key parameters for ARM Cortex-R CPUs. Table 5‑4. Key parameters for ARM Cortex-M CPUs. Table 6‑1. Key parameters for Andes v3 CPU cores. Table 7‑1. Key parameters for Tensilica reference template CPUs. Table 8‑1. Key parameters for Imagination MIPS Warrior CPU cores. Table 9‑1. RISC-V base instruction sets and extensions. Table 9‑2. Key parameters for SiFive CPU cores. Table 10‑1. Key parameters for Synopsys ARC EM and SEM cores. Table 10‑2. Key parameters for Synopsys ARC HS cores. Table 11‑1. Key parameters for Adapteva Epiphany cores. Table 11‑2. Key parameters for Beyond CPU cores. Table 11‑3. Key parameters for Ceva baseband-controller IP. Table 11‑4. Key parameters for first-generation Cortus CPU cores. Table 11‑5. Key parameters for Cortus APS2x CPU cores. Table 12‑1. Comparison of low-end embedded CPU cores. Table 12‑2. Comparison of midrange embedded CPU cores. Table 12‑3. Comparison of high-end embedded CPU cores. Table 12‑4. Comparison of low-end CPU cores. Table 12‑5. Comparison of high-performance CPU cores. Table 13-1. Key parameters for Mali ultra-low-power GPUs. Table 13‑2. Key parameters for Mali area-optimized GPUs. Table 13‑3. Key parameters for Mali performance-optimized GPUs. Table 14‑1. Key parameters for Imagination Series7 GPUs. Table 14‑2. Key parameters for Imagination Series8XE GPUs. Table 15‑1. Key parameters for VeriSilicon GC8000 high-end GPUs. Table 15‑2. Key parameters for VeriSilicon GC8000 low-end GPUs. Table 16‑1. Comparison of GPU cores for wearables. Table 16‑2. Comparison of low-cost GPU cores. Table 16‑3. Comparison of midrange GPU cores. Table 16‑4. Comparison of high-end GPU cores. Table 17‑1. Key parameters for ARM CCI and NIC interconnects. Table 17‑2. Key parameters for ARM CCN and CMN interconnects.